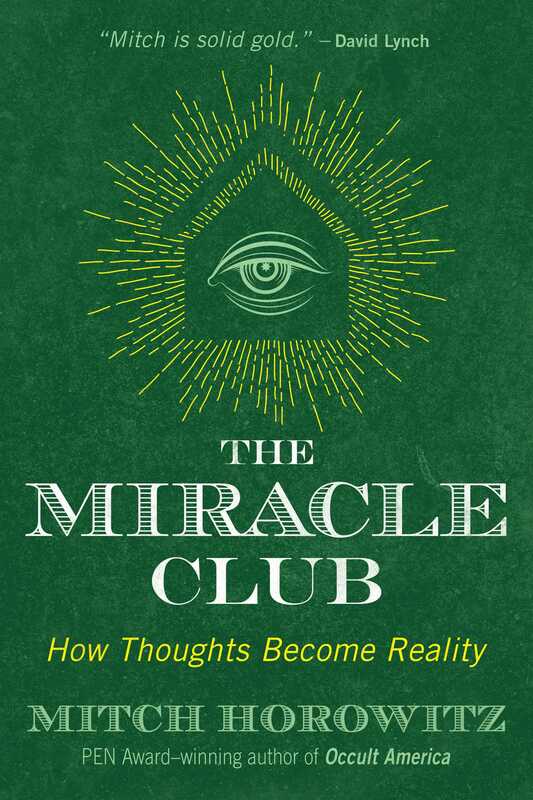 Following in the footsteps of a little-known group of esoteric seekers from the late-nineteenth century who called themselves “the Miracle Club,” Mitch Horowitz shows that the spiritual “wish fulfillment” practices known as the Law of Attraction, Positive Thinking, “the Secret,” and the Science of Getting Rich actually work. Weaving these ideas together into a concise, clear formula, with real-life examples of success, he reveals how your thoughts can impact reality and make things happen. Laying out a specific path to manifest your deepest desires, from wealth and love to happiness and security, Horowitz provides focused exercises and concrete tools for change and looks at ways to get more out of prayer, affirmation, and visualization. He also provides the first serious reconsideration of New Thought philosophy since the death of William James in 1910. He includes crucial insights and effective methods from the movement’s leaders such as Ralph Waldo Emerson, Napoleon Hill, Neville Goddard, William James, Andrew Jackson Davis, Wallace D. Wattles, and many others. Defining a miracle as “circumstances or events that surpass all conventional or natural expectation,” the author invites you to join him in pursuing miracles and achieve power over your own life. I have spent nearly twenty-five years of my adult life searching through the spiritual culture-- during which time I have worked as a body-mind-spirit publisher, a historian of alternative spirituality, and an individual seeker, sampling and struggling with many of the ideas of self liberation and self-development on the current spiritual scene (and working with the originators of some of these ideas). This period of time has convinced me of the existence of one deeply powerful force, which can be cultivated as a means of advancing toward a sense of personal completeness, meaning, and self-purpose. We are always using this force, or more often are used by it, for good or ill. This force exerts a kind of gravitational pull, sometimes strong enough to flatten or abrogate mountains of circumstance, or erect new mountains, blocking our path to where we think we want to go. This force functions, either intimately or on a macro scale, as a catalyst for harmony or friction. It can deliver us to circumstances and events that surpass all conventional or natural expectation, which, as noted earlier, I define as a miracle. What is this overlooked energy? The power of one deeply felt wish. One finely honed, exclusively focused, and passionate felt desire. Something that feels to you like breath itself. Find this, and you will discover a power like none other available to you. This concept initially reached me through the example of one of the most impactful thinkers of the past century, Bill Wilson, cofounder of Alcoholics Anonymous. In 1934, Bill was hospitalized and desperate for a solution to his compulsive and self immolating drive to drink. His longtime friend Ebby Thacher introduced him to the principle that alcoholism requires a spiritual solution. Bill was able to stay sober by embracing the ideas that Ebby brought to him, including principles from the Christian fellowship the Oxford Group, psychologist Carl Jung, and philosopher William James. Bill used these ideas, and the experience of his own spiritual awakening, to lay the basis for the twelve-steps and Alcoholics Anonymous. Yet, tragically, Ebby Thacher, the man who ignited Bill Wilson’s interest in spiritual self help, soon relapsed into drunkenness. Ebby spent much of his remaining life in a battle with alcohol, often ill and destitute. When Ebby died in 1966, he was sober but living as a dependent at a recovery center in upstate New York. Bill regularly sent him checks to keep him going. Not that Bill’s legs were always strong. He continually struggled with depression and chain-smoking. But he did attain his life’s goal. Until he died in 1971, he never drank again. Why did one man remain sober and another relapse? After those first two years . . . why did Ebby get drunk? It was he who gave Bill the philosophy that kept him sober. Why didn't it keep Ebby sober? He was sincere, I’m sure. Perhaps it was a difference in the degree of wanting sobriety. Bill wanted it with his whole soul. Ebby may have wanted it simply to keep out of trouble. Bill wanted it with his whole soul. That is the key. Within the parameters of physical possibilities, you receive what you “want with your whole soul”--whether inner truth, a personal accomplishment, relationships, or whatever it is. Excluding some great countervailing force, and for either ill or good, the one thing that you want above all else is what you get. This may beg dispute. People claim that they have not received what they want in life. But we can fool ourselves. Sometimes our memory gets clouded over or rearranged during an interval of time, and we emotionally disclaim or forget what we focused on intensively at an earlier stage of life. Other times we are simply oblivious to what we want, telling ourselves internally what we think we should want (e.g., a nice family, a good home), but we actually harbor a different wish, one that we sometimes deny or fail to recognize when it presses at the walls of our awareness. Positive-mind philosophy places a demand on us, one that we may think we’ve risen to but have never really tried. And that is: To come to an understanding of precisely what we want. When we organize our thoughts in a certain way--with a fearless maturity and honesty--we may be surprised to discover our true desires. A person who considers himself “spiritual” may uncover a deep wish for worldly attainment; someone who has labored to support the work of others may find that he has deeply unsettled yearnings of his own for self-expression; someone who is very public or extroverted may realize that he really wants to be alone. Recall scientist Dean Radin’s story from the previous chapter. His research assistant told him he must first arrive at a vivid picture of what he wanted, which in his case was an experienced neuroscientist willing to analyze nontraditional data for free. Dean refined his focus to the ends. When you begin to identify your natural desires, you begin to distinguish the means from the thing itself. And the thing itself is everything. This process is not a mental exercise alone. In Dean’s case, a tremendous degree of effort and background work predicated his abilities of causation and visualization. His actions in all their forms--work, study, effort, enterprise--enlisted other possibilities, including the intellectual, physical, and extra-physical. His act of focus was the closing catalyst. You must hone your focus while pushing on the handles of a plow. Thought without labor is like faith without works: dead. Mitch Horowitz is a PEN Award-winning historian, longtime publishing executive, and a leading New Thought commentator with bylines in The New York Times, Time, Politico, Salon, and The Wall Street Journal and media appearances on Dateline NBC, CBS Sunday Morning, All Things Considered, and Coast to Coast AM. He is the author of several books, including Occult America and One Simple Idea. He lives in New York City. "Treats esoteric ideas and movements with an even-handed intellectual studiousness that is too often lost in today's raised-voice discussions." "Horowitz affirms that every human being has the innate ability to bend reality toward a particular result, and that we are always using this power for good or for ill whether we are aware of it or not. Encouraging exploration, he provides understanding, exercises, and tools to make our visualizations, affirmations, and prayers effective." "Already hailed as a modern classic...Horowitz is among the most articulate and authoritative voices in the fields of alternative spirituality, occult and esoteric history...Horowitz comes across as the real deal: he is an authentic 'adept mind' and he knows his stuff." "I hope you will enjoy this book as much as I have, and finish it with many pages of ideas and methods you have taken from it, ripe for trial and experience." Use the ideas you encounter, don’t simply establish a metaphysical bank account of possible future beneficial actions."